The four short years since Digital Communication over Fading Channels became an instant classic have seen a virtual explosion of significant new work on the subject, both by the authors and by numerous researchers around the world. Foremost among these is a great deal of progress in the area of transmit diversity and space-time coding and the associated multiple input-multiple output (MIMO) channel. This new edition gathers these and other results, previously scattered throughout numerous publications, into a single convenient and informative volume. 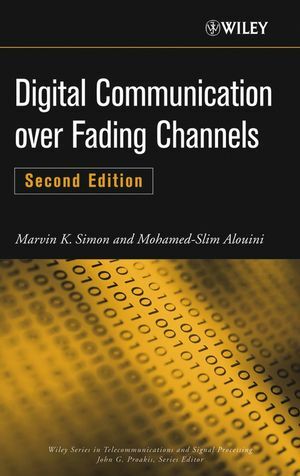 Digital Communication over Fading Channels, Second Edition is an indispensable resource for graduate students, researchers investigating these systems, and practicing engineers responsible for evaluating their performance. MARVIN K. SIMON, PhD, is Principal Scientist at the Jet Propulsion Laboratory, California Institute of Technology, Pasadena. MOHAMED-SLIM ALOUINI, PhD, is Associate Professor in the Department of Electrical and Computer Engineering of the University of Minnesota, Minneapolis. Chapter 2. Fading Channel Characterization and Modeling. Chapter 3. Types of Communication. Chapter 4. Alternative Representations of Classical Functions. Chapter 5. Some Useful Expressions for Evaluating Average Error Probability Performance. Chapter 6. New Representations of Some Probability Density and Cumulative Distribution Functions for Correlative Fading Applications. PART 3: OPTIMUM RECEPTION AND PERFORMANCE EVALUATION. Chapter 7. Optimum Receivers for Fading Channels. Chapter 8. Performance of Single–Channel Receivers. Chapter 9. Performance of Multichannel Receivers. PART 4: MULTIUSER COMMUNICATION SYSTEMS. Chapter 10. Outage Performance of Multiuser Communication Systems. Chapter 11. Optimum Combining—A Diversity Technique for Communication Over Fading Channels in the Presence of Interference. Chapter 12. Direct-Sequence Code-Division Multiple Access (DS-CDMA). PART 5: CODED COMMUNICATION SYSTEMS. Chapter 13. Coded Communicatuion over Fading Channels. Chapter 14. Multichannel Transmission—Transmit Diversity and Space-Time Coding. Chapter 15. Capacity of Fading Channels.